Sponges for Restaurants and Kitchens help clean those sticky plates, bowls, pots and pans. 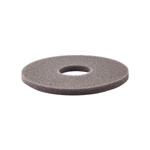 Our restaurant supply sponges are strong and durable for use in the busiest commercial kitchens and dining areas. We sell more kitchen cleaning products than anyone. Update International Plastic Drip Tray With Sponge Black - 4.5 in. Poly White Block Sponge - 2.8 in. x 5 in.x 0.91 in. 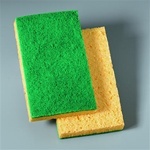 Buy your restaurant supply sponges from the leader in restaurant supply to wipe down walls and sinks in the restrooms. Use them to wipe down tables, kitchen surfaces and equipment.